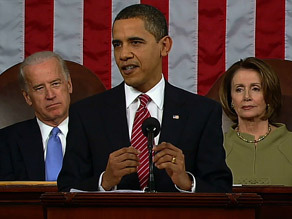 WASHINGTON (CNN) -- A national poll indicates that two-thirds of those who watched President Obama's address to a joint session of Congress on Tuesday night felt very good about his speech. Sixty-eight percent of speech-watchers questioned in a CNN/Opinion Research Corp. survey said they had a very positive reaction, with 24 percent indicating that they had a somewhat positive response and 8 percent saying they had a negative reaction. The audience watching his speech was not a perfect match with the nation's breakdown by political party, presumably because the president is a Democrat. The speech audience questioned in the CNN/Opinion Research Corporation poll was about 8 to 10 points more Democratic than the general public. iReport.com: Did Obama knock it out of the park? After Clinton's first address to Congress in February 1993, 79 percent of speech-watchers supported his policies. George W. Bush got virtually the same amount of support for his proposals after his first speech to Congress eight years ago. "[Obama's high level of support] may mean that speech-watchers were rallying around the new president as much as they were rallying around his proposals," Holland said. "That may strike a cautionary note for the Obama White House, since Clinton's proposals in 1993 were initially well-received but quickly ran into trouble with Congress and the American public." A big question is whether the address, which was watched by millions across the country, changed minds. "Among speech-watchers, the number who thought Obama's policies will move the country in the right direction grew by 17 points after they listened to Tuesday's address," Holland added. Eight out of 10 said the president's plans will improve the economy and 68 percent said his proposals will reduce the federal deficit. Three out of four questioned said Obama's plan will improve health care and 82 percent said his proposals will create or save jobs across the country. The poll surveyed 484 speech-watchers by telephone minutes after the president finished his address. The CNN/Opinion Research Corporation poll's margin of error is plus or minus 4.5 percentage points.